When my friend Jimi made this salsa, she and Aurora and I stood in my kitchen and ate a not-insignificant sized bowl in about 10 minutes. 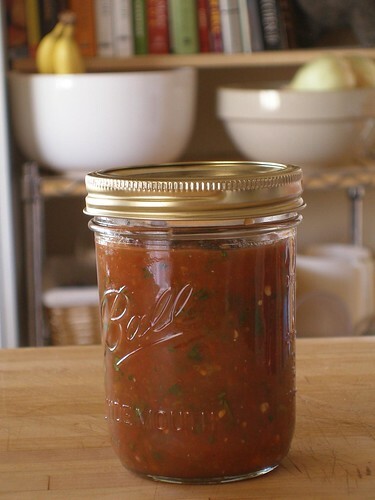 Luckily this salsa recipe is also quick and easy and makes a bunch to share (or save). You can easily halve it, but since we've been going through it pretty quickly, I made a big batch. Also, after a few days, any leftovers taste wonderful added to tortilla soup, or slathered over breakfast. Note- When I say 'blend' I mean either pulsing it in an upright blender or mixing it with an immersion blender. When I say 'stir' I mean with a spoon till it's mixed. 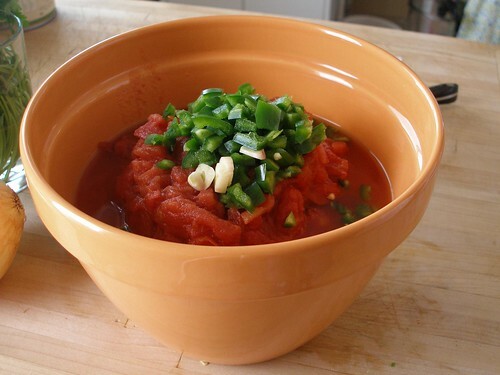 -Combine the tomatoes, the peppers and the garlic (in either the blender or a big bowl). -Blend till it's fairly uniform and the peppers are in tiny pieces. 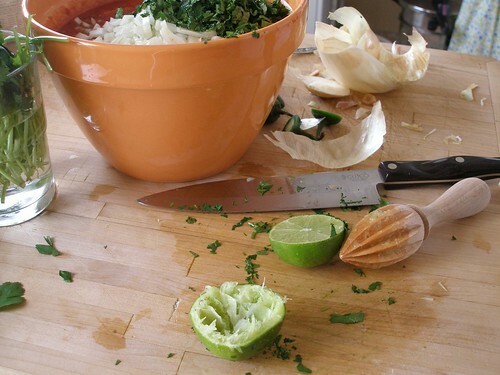 -Stir in the onion, cilantro and half the lime juice. -Taste and add salt and more lime juice as needed. -If you like your salsa chunkier, start with half a can of tomatoes and blend that with the peppers and garlic till they're in tiny pieces. Then add the rest of the tomatoes and pulse briefly. 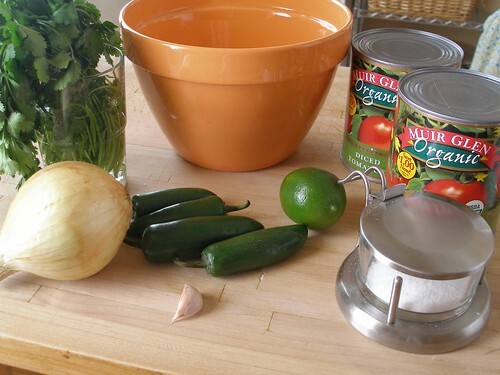 -You may be tempted to blend up the onions and cilantro (especially if you don't really like them), but I wouldn't suggest it. Chopping them and stirring them in actually contains their flavor and keeps it from overpowering the entire thing. 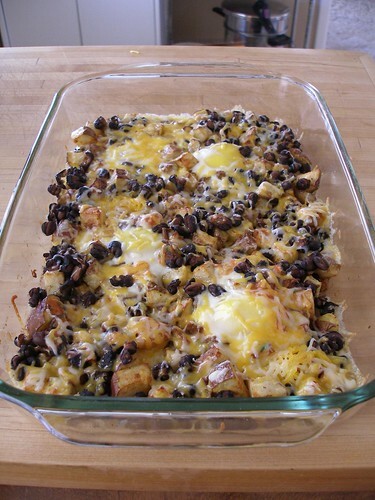 Note- My brother called me on Sunday night and told me that I was totally accurate in describing the addictiveness and general wonderfulness of this recipe. 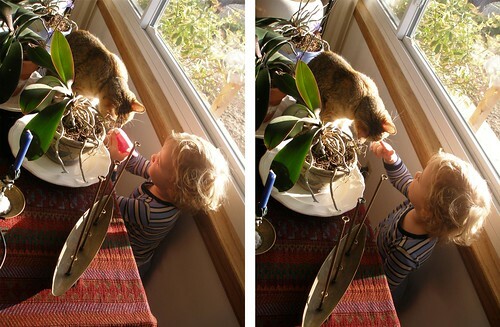 He said he was *this* close to using a spoon. 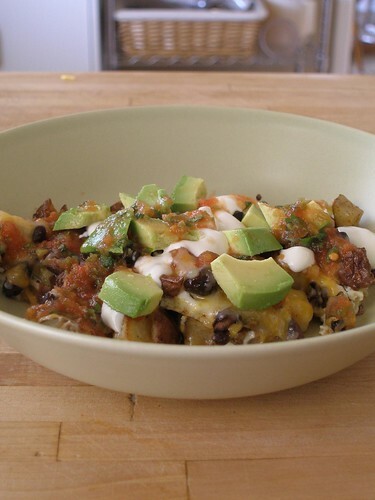 We call them Potachos (short for Potato Nachos). Feel free to call them whatever you want. They won't mind. 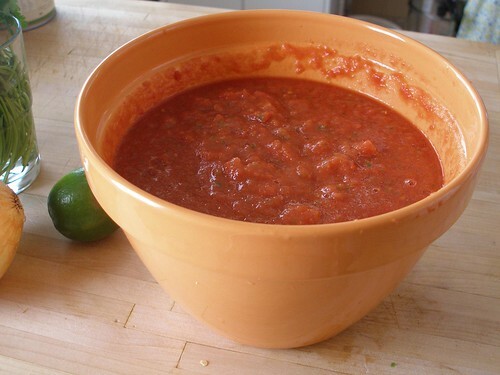 I must admit that I invented this one tortilla chip-less morning as I was pondering the best way to get a fantastic batch of leftover salsa into my mouth by a means other than a spoon. As it turned out to be really tasty (and easy) I thought I'd share the results with y'all. And I haven't yet verified it, but I feel sure that this would be perfect hangover food. -First mix the potatoes in a bowl with the oil, salt, pepper and chili powder. You want the potatoes to be all glisteny with the oil and well seasoned with the spices. 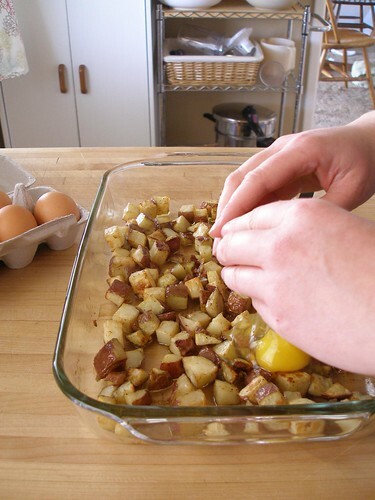 -Pour into a baking dish. 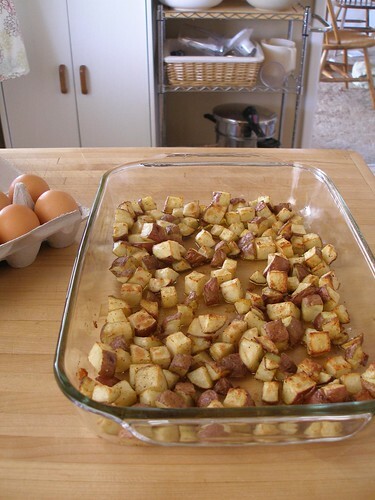 -Put in a 450 degree oven until the potatoes are well cooked and all brown and crispyish. It's a good idea to scrape the bottom once with a sturdy spatula. 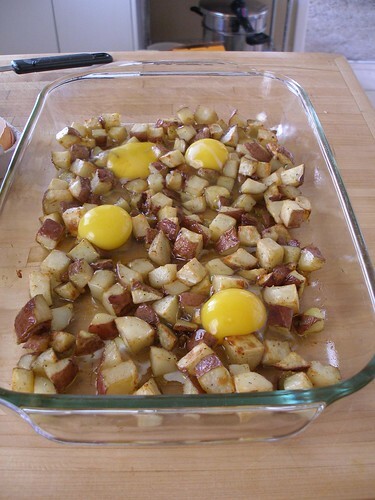 -Remove from oven, and both carefully and quickly, break the eggs all over the potatoes, doing your best to keep the yolks intact, if you like runny eggs, which I do. 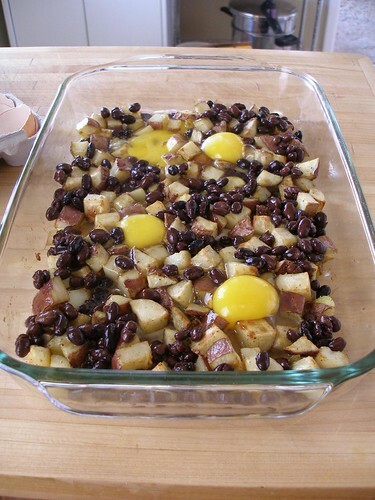 -Put back in the oven until the eggs are done to your liking. 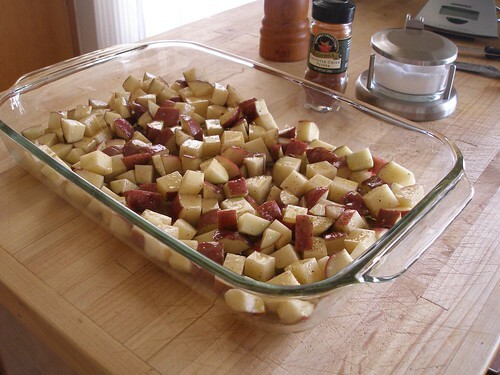 -Remove from oven and sprinkle on the cheese. And the salsa. Feel free to nacho these up to whatever level your arteries can handle. 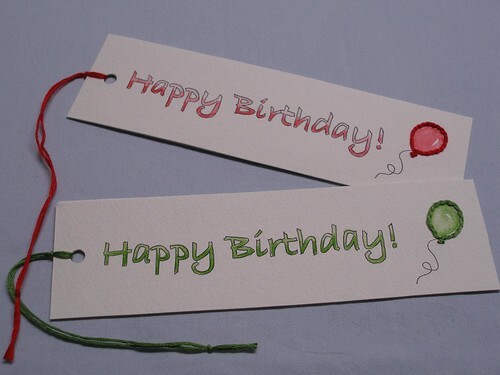 Today I'm wrapping up the series of tutorials for the book gift set with a hand sewn and hand painted bookmark, which, conveniently doubles as a gift tag for the whole shebang. 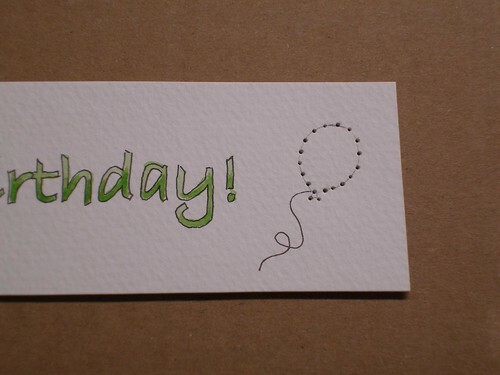 -and if you really wanna go above and beyond, tuck a gift card from your local bookstore into the library card pocket. But, really, that should probably be reserved for Grandparent-level spoiling. Individually, any of these are pretty great gifts. But, put it all together and it's extra fun. And I have to say, there were adults who were jealous of the kids who received these. So don't limit it to just the little ones. OK, on to the tutorial. -Watercolor Paper (This stuff is really thick and absolutely necessary for this project). -Light Box (optional, but really helpful) I have a Light Tracer . -Cut out 2 pieces of watercolor paper, each 2 inches by 7 inches. 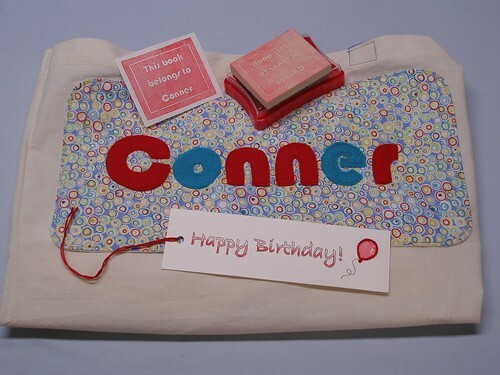 -On one of the pieces, using the pen, outline the words 'Happy Birthday' (or their name or 'Merry Christmas' or 'Good Night and Have a Pleasant Tomorrow'), along with whatever little design you want to embroider, leaving room to punch the hole. 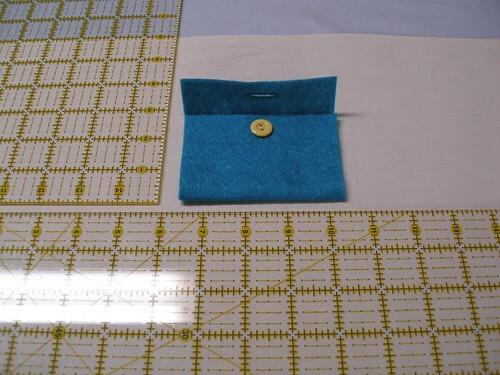 -On top of a thick piece of cardboard (or corkboard), use a pushpin to make holes along the length of the embroidery design. This part isn't completely necessary, but it does help create even stitches as well as make pulling the needle through the paper less aggravating. -Write the To: and From: info on the second piece of paper. -Now using a low temp hot glue gun, attach the pieces of watercolor paper together, keeping the glue at least a quarter of an inch from the edges. -Don't stress if a lot of the glue has cooled before you get it all stuck together. -Iron the whole thing (using medium setting) for about 10 seconds. Check the bookmark and squoosh together with your fingers. 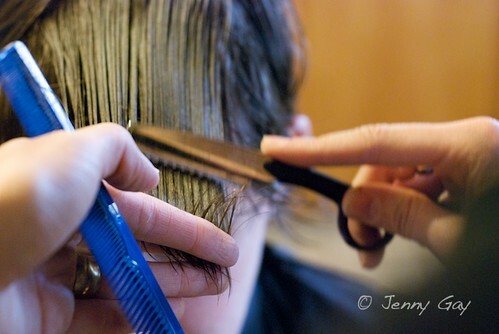 The glue should gently heat up, allowing you to push the papers together firmly. If the glue hasn't softened enough, re-cover and iron again. 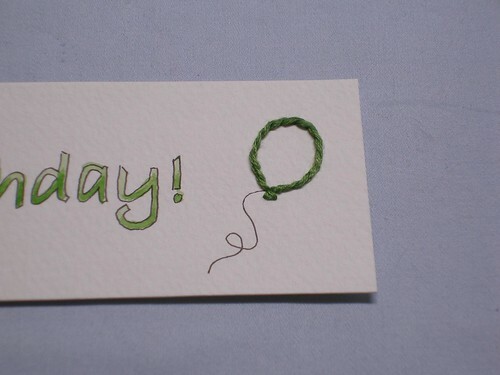 Note- I would NOT try this with any paper other than thick watercolor paper. You will burn your fingers. 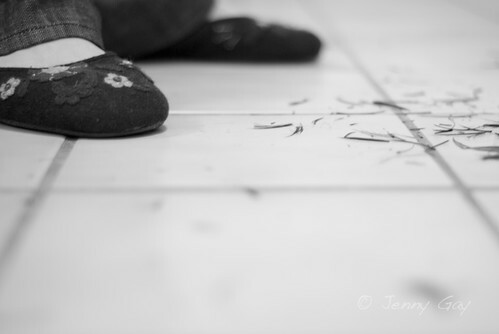 -Punch a hole and thread with floss. -The idea for embroidering bookmarks on paper came directly from Aimee Ray's book Doodle Stitching: Fresh & Fun Embroidery for Beginners . If you're interested, this book has some really cute patterns. -For these, I would suggest making the embroidered design fairly simple, which will keep the time frame for this project manageable. 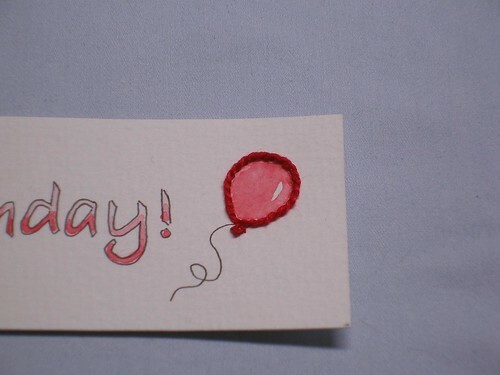 This balloon took me less than 10 minutes to embroider. The entire thing took less than 30 minutes total. - You can cut off the corners with a punch (or use scissors), but I didn't think it looked all that much better for the level of effort it required. Note-Even though this already happened, you can still check out the satellite tracker website and see what upcoming events will be visible to you. The ones labeled 'Very Bright' are going to be the best. 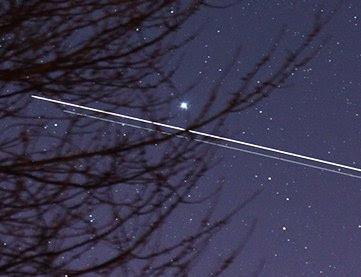 This is just a quick post to let you all know that if you look up in the sky this evening, you might be able to see both the International Space Station as well as the Space Shuttle Discovery as the crew of the Discovery goes about replacing some of the solar panels on the station. According to the very cool website, spaceweather.com, "Just before the two spaceships joined, Quintus Oostendorp watched them fly side-by-side over his backyard in the Netherlands." He was able to get this amazing picture. The exact times it'll be visible in your area can be found if you enter your zip code in the satellite tracker at spaceweather.com. And from what I can tell, it'll be visible for just a couple of minutes. In just a bit, we're headed out on the roof so Joey can use a compass and protractor to figure out in what direction and at what elevation everything will be visible tonight. Maybe we'll even practice in the bathroom to figure out how to keep the shutter open on our camera. This comes right on the heels of our day at the science museum yesterday, where we learned why it is that if you head out into space without your suit, your blood will boil and your lungs will explode. She didn't like seeing the marshmallow man expand in a vacuum, but it was pretty amazing to watch water boil at room temperature. 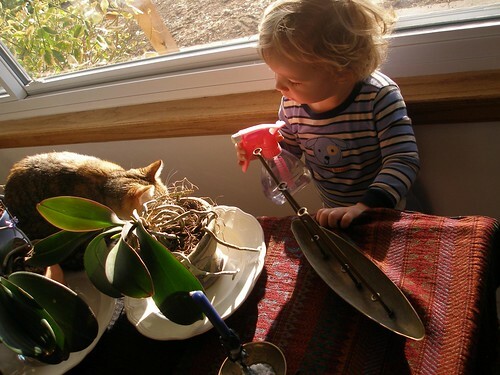 Honestly, my favorite thing about homeschooling is that I get to share in so much of this learning with her. His exact words were, "I waitin for her ta chew on dah pwant." He stood there for a good 10 minutes before he got his chance. 49- I think this is my favorite video ever. 48- My handwriting is almost exactly like my mom’s and my sister’s. 47- As a kid, I've experienced exactly what Pink Floyd sang about in Comfortably Numb. “my hands felt just like two balloons” I still get it as an adult occasionally. Without the help of drugs, I feel I should add. 46- I cried inconsolably when I saw Han Solo frozen in carbonite. My parents had to carry me, bawling, past a long line of people waiting to see the movie while I ruined it for them, sobbing about the fact that Han Solo was dead. Wait, you have seen Empire Strikes Back, right? Crap, did I ruin it for you too? 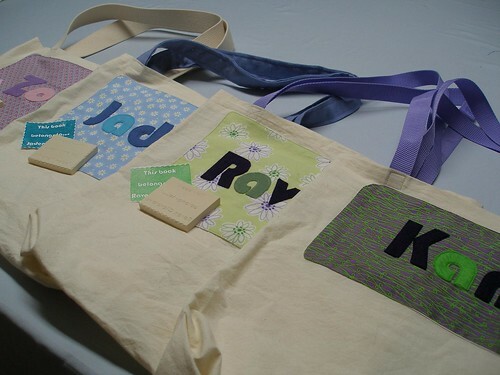 Here is the tutorial for how to make the library bags to go with the bookplate stamps. Sometime next week I'll have one more tutorial to round off this book-themed gift set. Note- This is a pretty long tutorial. 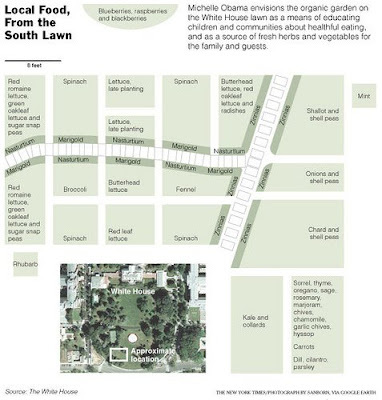 It is because I am somewhat overly detailed. As for how long it takes to actually make these, I would estimate it at about 2 hours each. Maybe 3. It isn't super quick, but isn't too bad either. 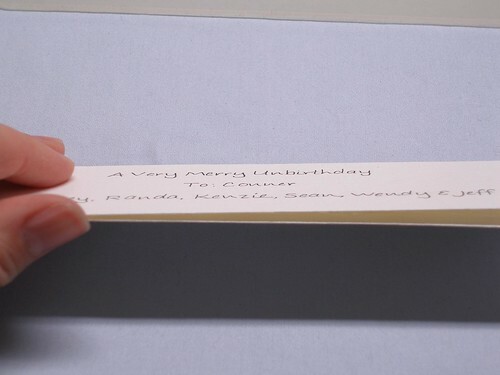 I think it's totally worth it for such a useful, personalized present. The kiddos who got these for Christmas really love theirs, so much so that they want to make them as presents for all of their friends. Also since making one of these for Joey, we have spent A LOT less time searching for her library card because it is always in her bag. -First of all, get a cat to lay down on the prototype bag. 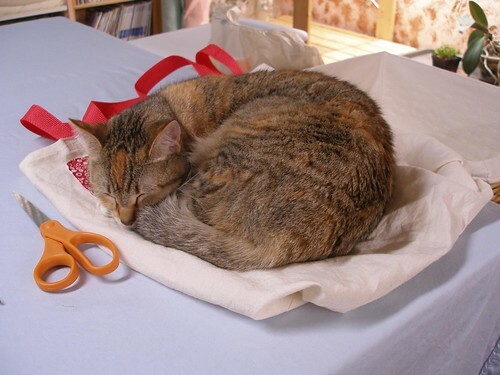 This is especially amusing if her comfy, little, kitty basket is right behind her, put there specially so she won't climb on the sewing table. 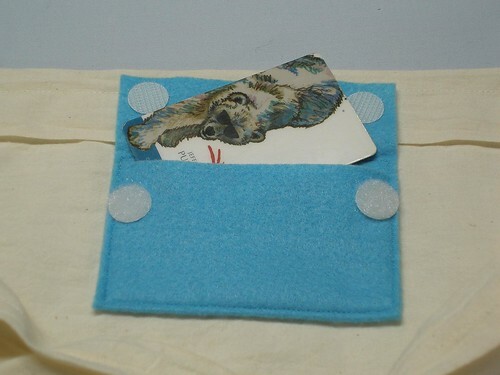 -One piece of felt for the pocket, 4" by 7". 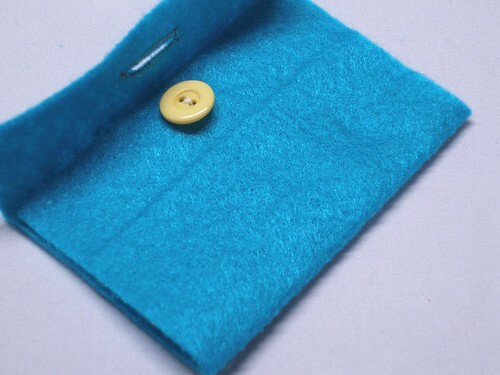 I suggest you use actual wool felt for this, not the cheap craft stuff, which won't hold up very well. 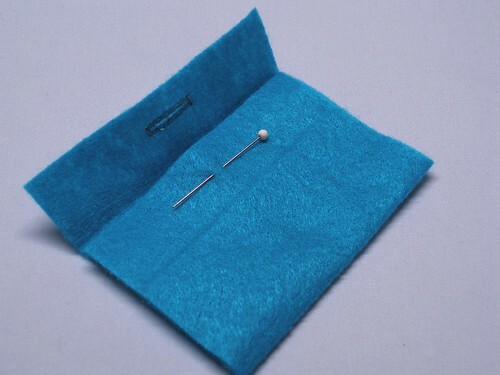 -If using a button, go ahead and sew a buttonhole on the top flap of the rectangle. 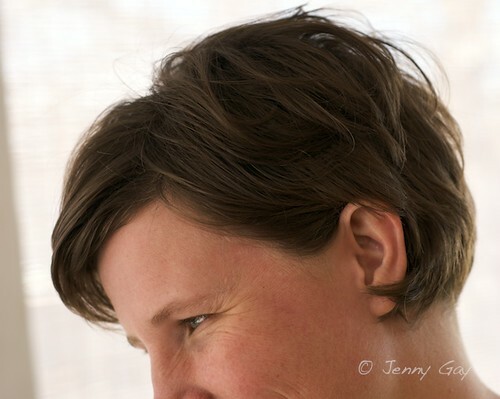 (I had never sewn a buttonhole until I did this right here. It was brilliant.) Then sew on the button. -Center the pocket on the plain bag fabric, about 6 inches down from one of the short edges. 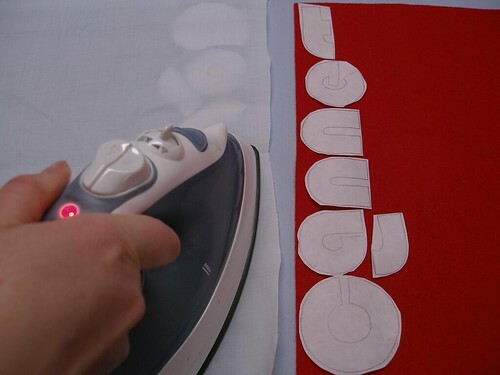 -Iron the pocket to set the glue. -Using an 1/8th inch seam allowance, sew the pocket to the bag, like so. -Open the pocket up, start at A, sew to B and then over to C.
-Fold bottom of felt up and sew from C to D to E and back up to B. Backstitch. 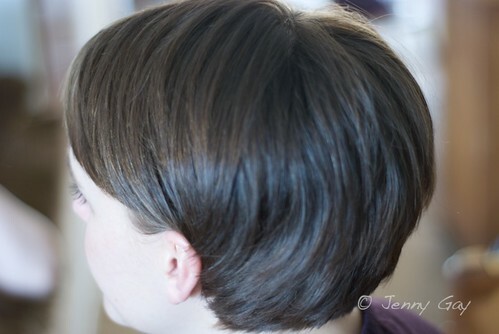 -If you're using velcro instead, you can attach it now. Or do it later. Whatever. I'm easy. -I printed up the names in Bauhaus 93, outlined font (Same as the bookplates. I love me a theme, especially within a theme.) Doing it in outline keeps it from printing a bunch of giant, ink-wasting letters. Also, since you'll be tracing these, you don't need to print more than one of each letter. (A fact I didn't realize until after I'd printed 3 sheets.) I did these at a font size of 240. 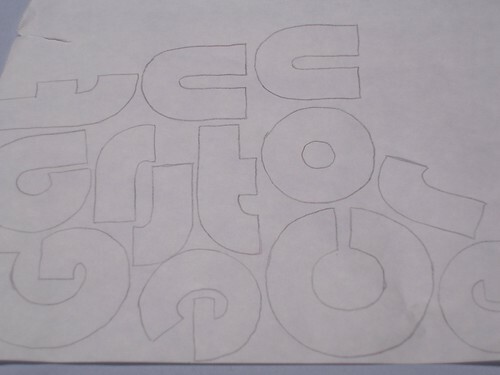 -I traced these onto the freezer paper, all squooshed together. It was a bit like Tetris, but you can move the shapes horizontally as well as drop them vertically. Very satisfying for those of us with a slight case of OCD. 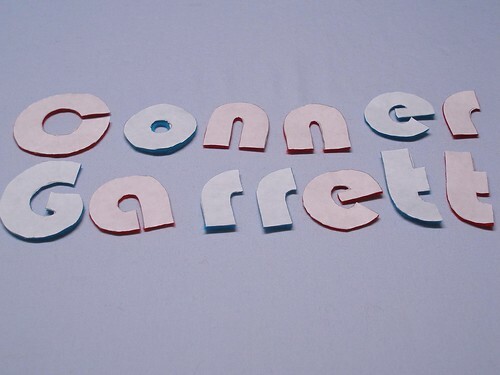 -If I'd have been thinking clearer (or my OCD had been working properly), I would have separated the letters into two different groups (one for each color). If you do this, just make sure that you leave enough space between the two groups of letters. 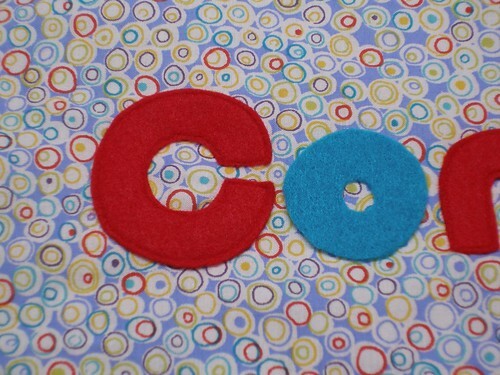 -If you do have your letters grouped by color you don't need to cut the freezer paper first like the pictures, just place on the pieces of felt as is. 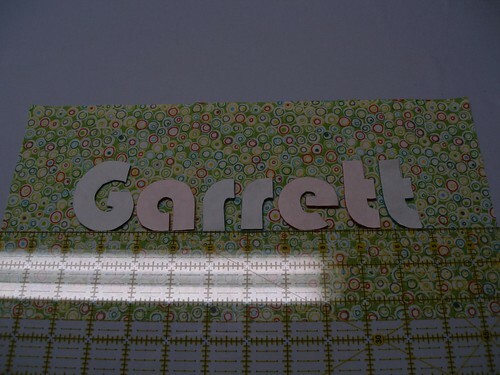 -If you didn't separate out the colors, rough cut out the letters and place them, shiny side down, on the felt. -Cover with a press cloth and iron (on medium) for between 5 and 10 seconds. 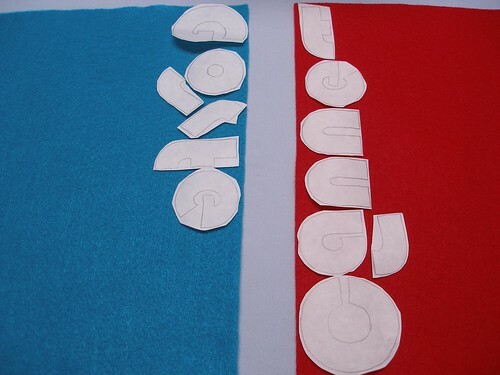 -Check to see that the letters are well stuck to the felt. Iron again if not firmly attached. 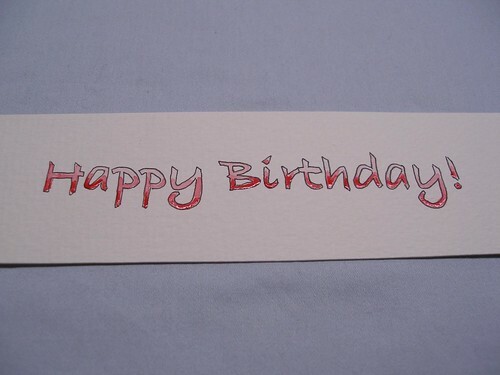 -Cut out the letters along the lines. 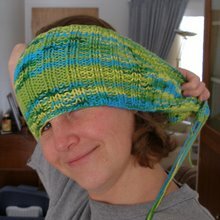 -Grab the piece of colored fabric that is 7 inches by 14 inches. 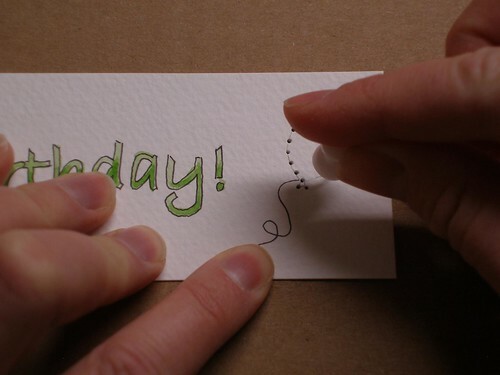 -One at a time, pick up a letter, apply regular old glue stick glue to the back of the letter and put back in place, pressing firmly. I pulled the freezer paper off as I did this to help me remember which ones I'd glued. 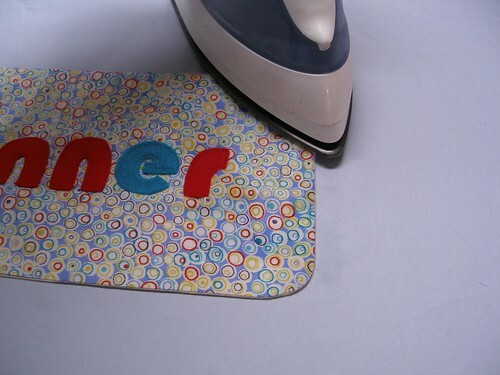 -When they're all where you want them to be, use a press cloth and go over it with the iron to set the glue. 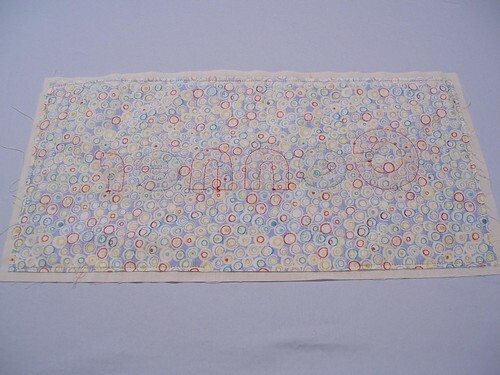 -Grab the white piece of fabric (7.5 by 14.5 inches). Sew it to the decorative fabric right sides together, going around the edges of the smaller, colored one, leaving at least a couple inches unsewn to turn right side out. -I sewed rounded corners (or at least I came back and sewed rounded corners when I remembered) because they are much easier to work with than the 90 degree corners. 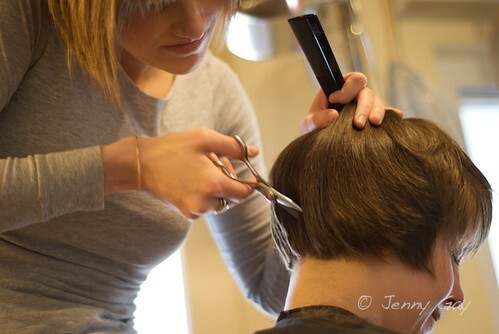 -Turn right side out, folding as necessary so that all the edges are straight. -Center the name on the backside of the fabric where the pocket was sewn. 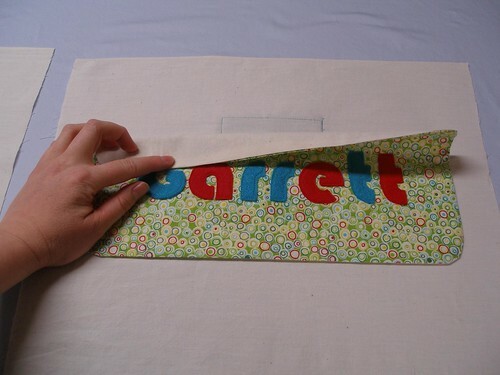 -Sew to bag (much easier if you do this before the bag is made). 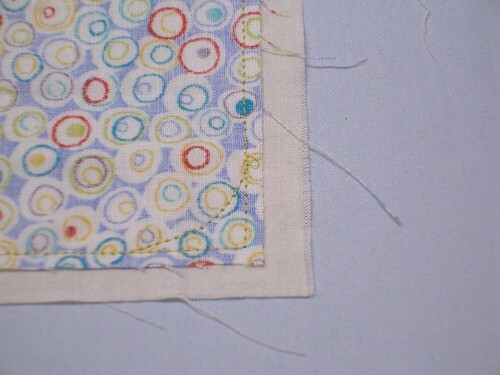 -Sew it all up like in this fabric bag tutorial. 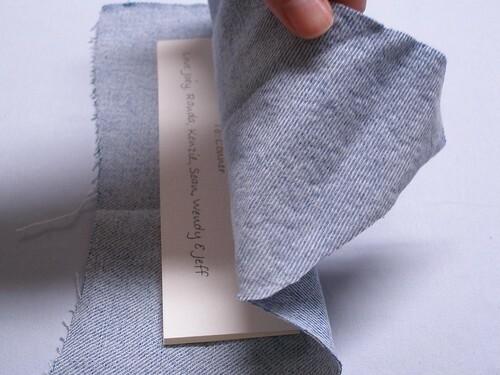 Though you'll only need to fold the top edges down once if the short edges of your fabric were on the selvedge. 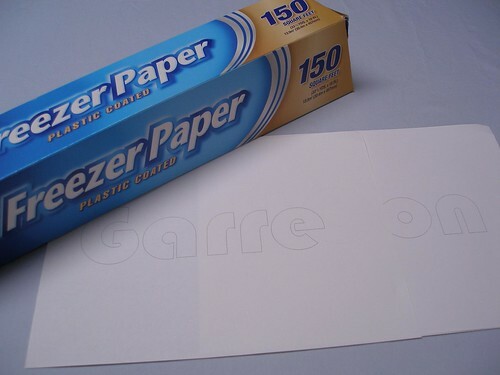 -For tracing the letters onto the freezer paper, I used my light tracer (best 30 bucks I ever spent). It isn't necessary, though. The lines show through the freezer paper well enough to do it without. 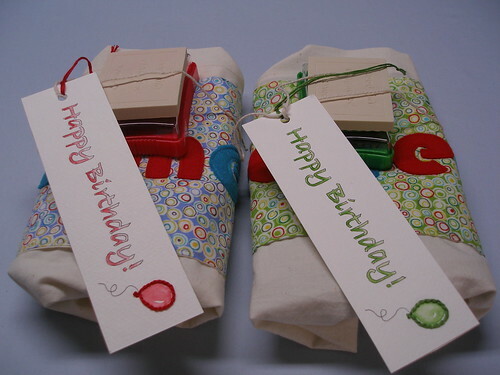 -Be sure to stick around to see the sewn bookmark that rounds off this gift set. -Also please let me know if anything is missing or confusing here. I've been staring at this for quite awhile now, so I'm in no state to make a qualified assessment.